Dimensions 1 by 7 by 10.25 in. Magic; Early works to 1800. Magic, Jewish; Early works to 1800. 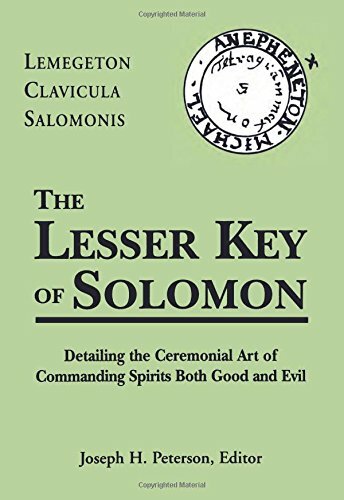 Amazon.com description: Product Description: Compiled from original manuscripts and fragments in the British Museum Library, Joseph Peterson's new presentation is the most complete and accurate edition of this famous magical grimoire, "The Lesser Key of Solomon the King." He goes to great length to establish the provenance of each part, and possible derivative works, including critical analyses of all major variations, utilizing fresh translations of earlier magical texts such as Johann Trithemius's Steganographia, The Archidoxes of Magic by Paracelsus, and newly discovered Hebrew manuscripts of the original Key of Solomon. Abundantly illustrated, Peterson includes reproductions of the original magical circles, tools, and seals of the spirits with variations of certain drawings from various sources and notae missing from earlier editions. Source list. Appendicies. Index. About: Compiled from original manuscripts and fragments in the British Museum Library, Joseph Peterson's new presentation is the most complete and accurate edition of this famous magical grimoire, "The Lesser Key of Solomon the King.